Ready to ride into the mysterious, romantic and often dangerous New West? 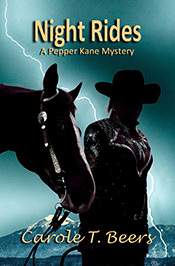 My Pepper Kane Mysteries will take you on that journey! Ex-reporter Pepper Kane and friends bring their horses from Oregon to a Seattle show to vie for jackpots that will kick up their plans for a Western Bed, Barn and Breakfast. On the eve of the show Pepper hears violence going down in a fairgrounds restroom, and learns someone was killed. Security is slow to help. Her Lakota-police partner is busy with another case. A transgender rider is threatened. When Pepper’s daughter doesn’t return calls and Pepper herself is threatened, she sticks the spurs to her sleuthing. The effects of prejudice—even when buried so deeply we don’t see them—drives this story. Through action and adventure in a darkly beautiful NW setting with dashes of humor and romance, we are reminded what open minds, friendship and honor really mean. Saddle Tramps (2016), a light whodunit with dark undercurrents and a splash of romance, centers on retired (but far-from-retiring) ex-reporter Pepper Kane as she rushes to learn who killed a prize show horse before the killer targets her. At the same time she must compete in a do-or-die horse show in California, prevent her tack shop “The Best Little Horsehouse in Oregon” from going belly up, and reach a decision about her lover, Lakota policeman Sonny Chief. Over the Edge (2017) dares our modern cowgirl-sleuth to solve mysteries and dodge death from Oregon to Texas—where Pepper and friends vie for big bucks at the World Western Open Horse Show. Along the way she battles doubt, betrayal and heart-pounding action that can change her life … or end it! In Ghost Ranch (2018), Pepper questions her deepest beliefs and desires while rushing to learn who killed a woman in the abandoned cabin of a famous writer. She and a fellow horsewoman had hoped to turn the riverfront property into a guest ranch. But unless she finds the killer, with the help of Sonny Chief, her dreams—if not her very life—will go up in flames.